Changing strategies at the right time can enhance returns in rising market trends and reduce risk in declining market trends, thereby preserving capital. We have a tested quantitative method designed to shift capital from a growth strategy to a conservative strategy at the appropriate time. By automatically and incrementally adapting to major market trends, our method is designed to boost returns in bullish markets and preserve capital in bearish markets. For example, in bull markets, most stocks rise in price, some more than others, and our Stocks Plus Portfolio has selected stocks that have substantially outperformed the S&P 500 Composite Stock Price Index in actual trading. In bear markets, most stocks go down, so we shift capital to our Safety First Strategy, which has preserved capital in actual trading when stocks decline. automatically and incrementally, without any effort on your part. Several options on this theme are available to fit your needs. 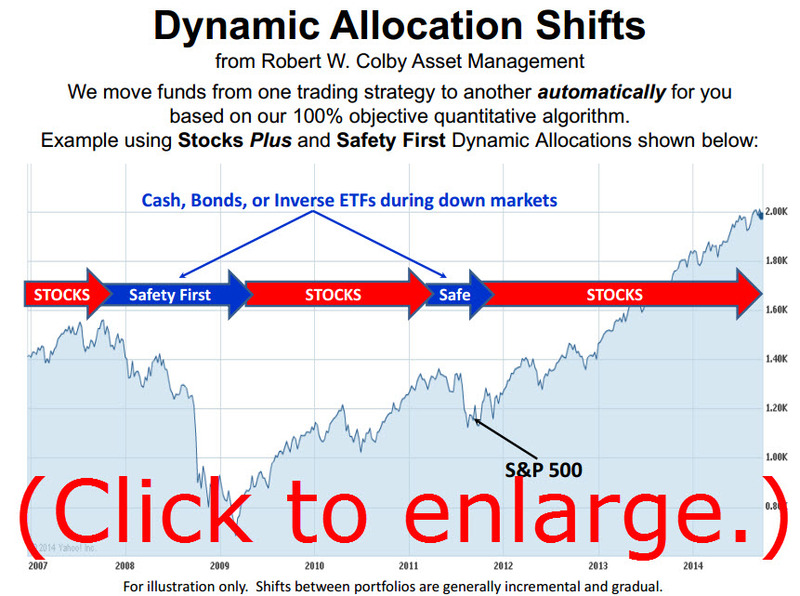 Call us today at 646-652-6879 to learn how our Colby Dynamic Allocation Shifts can help you.